BugDoc Dave here with the Tuesday Stretch offering! Since Russel Umbraco and Cal Hackeman have been concentrating on “crossover” pieces (dolphin-handled pieces and true carnival patterns with the stretch effect), I’m going to follow suit! I’m going to pick on a line of stretch glass that has a somewhat subtle, but definite pattern – Diamond’s #900 line which is called Adam’s Rib by collectors. This line is well documented in historic records and from what can be found today, it appears to have been made in the 1920s (when most of the stretch glass was made) until Diamond ceased production in 1931 (when many #900 pieces were made but not iridized). Adam’s rib pieces have thin, parallel ribs on the outside of the piece. A relatively large number of pieces were made though not all can be found with the iridescent stretch treatment. Surprisingly, the most obtainable pieces found are large footed bowls (which we would call comports today). These hefty pieces have a 4 ¾-inch wide base. The base and bowl portion have the ribs. 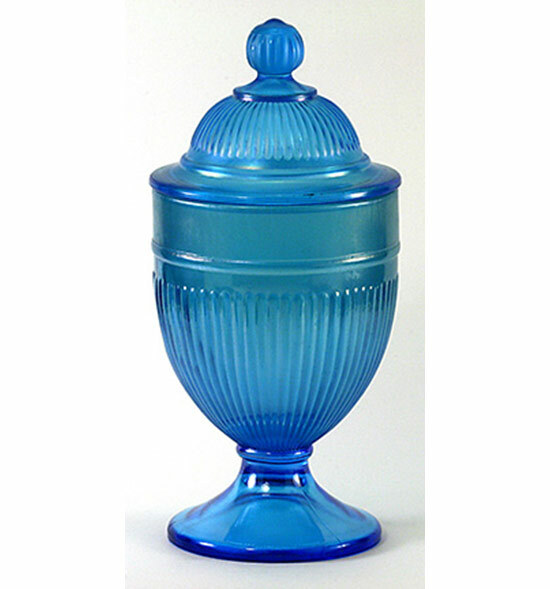 These pieces are most commonly found in Green and Blue (very similar to Fenton’s Florentine Green and Celeste Blue). 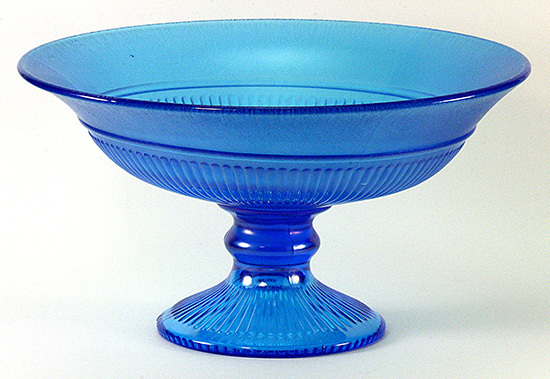 The tops can be “normal” (a deep bowl shape as it probably came out of the mold), flared, or with a rolled rim. One has been found in milk glass and the interior has a shiny marigold finish. 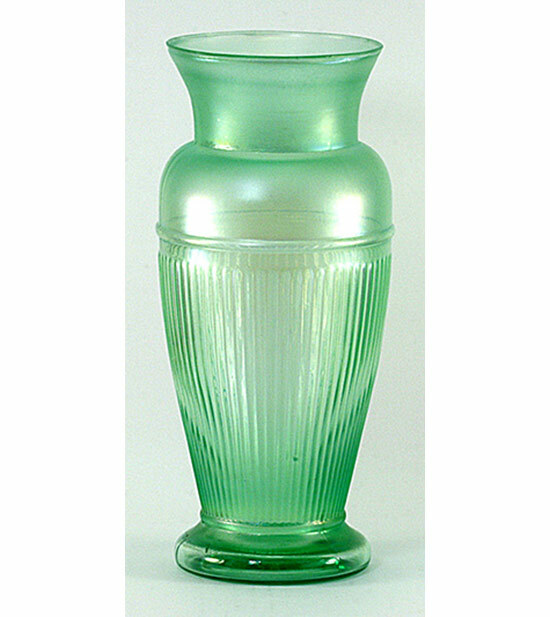 About as easy to obtain are the blown-molded candlestick/vases. These delicate pieces are known in Green and Blue and several marigold pieces are also known. I’ve seen the piece in non-iridized ebony glass (the dope fairy must have been sleeping that day!). 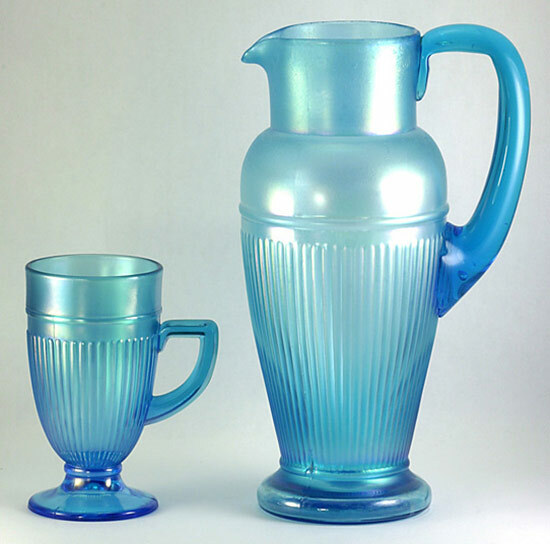 The much more difficult pieces are the blown molded vase, pitcher made from this vase, the handled mugs, sugar and creamer set, an 8-inch plate and the candy jar. There are very few Adam’s rib bowls with stretch effect. Virtually all of these pieces are in Blue or Green. 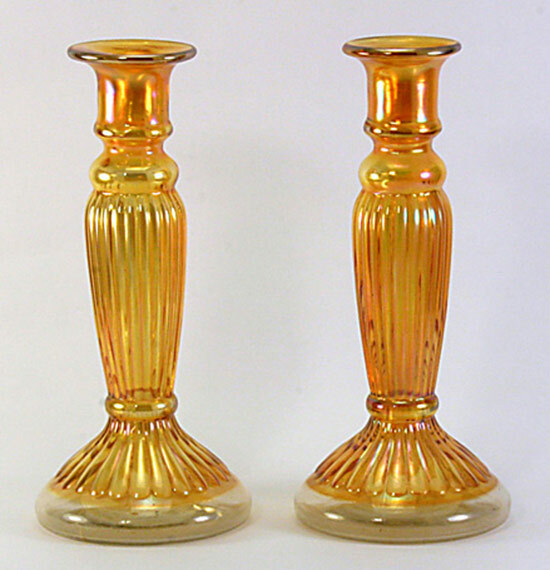 A pair of trumpet-shaped candleholders showed up on eBay some years ago and it was marigold on milk glass. 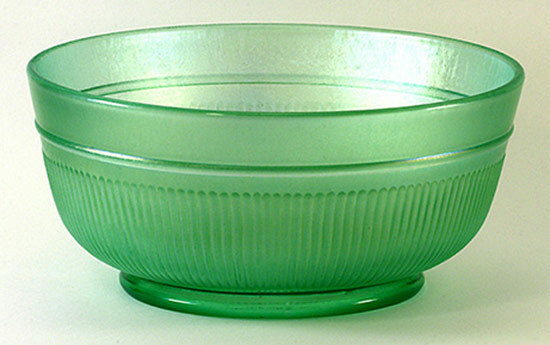 One 10-inch wide bowl is also known in milk glass, but this one has white iridescence on the inside and a light gray/tan stretch iridescence on the outside. All the Adam’s Rib pieces would be considered to be great finds, especially if they aren’t the large comports. 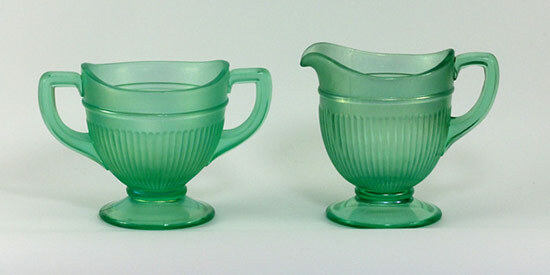 We’d love to hear if anybody has any of the Adam’s Rib pieces in crystal, pink or milk glass. The crystal and pink are Diamond colors and there was a rumor that a crystal handled mug exists! Feel free to contact me or send pictures to the HOC nightly mailing!